Host a Free Fishing Weekend event! Take advantage of this free opportunity to introduce your friends and family to fishing. All the waters of the state are open; however, all usual regulations are in force. 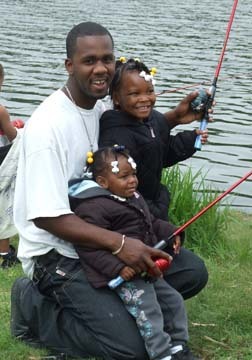 Download and complete the Free Fishing Weekend Planning Forms [PDF] to give us the details so that we can post your event on this site. If you have difficulties with this form, please contact Andrew Krismer for assistance, 608-333-2057. Remember to plan for adults who may have missed the fishing boat as kids! We’ll post your events as we learn of them. Of course, you can just take your friends fishing without telling us, but we love to hear your stories about how you coaxed your pals out for a free weekend of fishing. No fishing gear? No problem. We have fishing poles that you can borrow at many state parks and DNR offices. Contact a Tackle Loaner site at one of several state parks and DNR regional offices to borrow one. Call the DNR staffer or partner listed for each site to find out what specific equipment is available and to arrange to pick it up. New to fishing, but want to make it a habit after Free Fishing Weekend? Try our "First-time buyer" resident license for only $5. Discounts for non-residents too! Here is more information about purchasing a fishing license so you'll be ready to fish any time of the year! Other DNR-sponsored clinics are listed here and the Department of Tourism lists events at The Great Outdoors - Fishing,[exit DNR].